If ancient hunters from the ice age were still alive today, they would probably be wondering what shrunk all the deer. Deer come in all kinds of shapes and sizes, and for the most part, prehistoric deer look much like their modern equivalents (moose, whitetail, elk, caribou, musk deer, etc.). One thing that is different however, is the sheer size. In times past, massive deer with antlers that span the width of barns doors roamed across the land, coexisting with saber-toothed tigers and wholly mammoths. The earliest deer actually came from diminutive animals (Archaeomeryx and Dicrocerus) and barely rose more than a few feet off the ground. Throw in a few million years of evolution though, and you get something much bigger. Here are five of the largest prehistoric species in the deer family. Image from I, Atirador on the Wikimedia Commons. 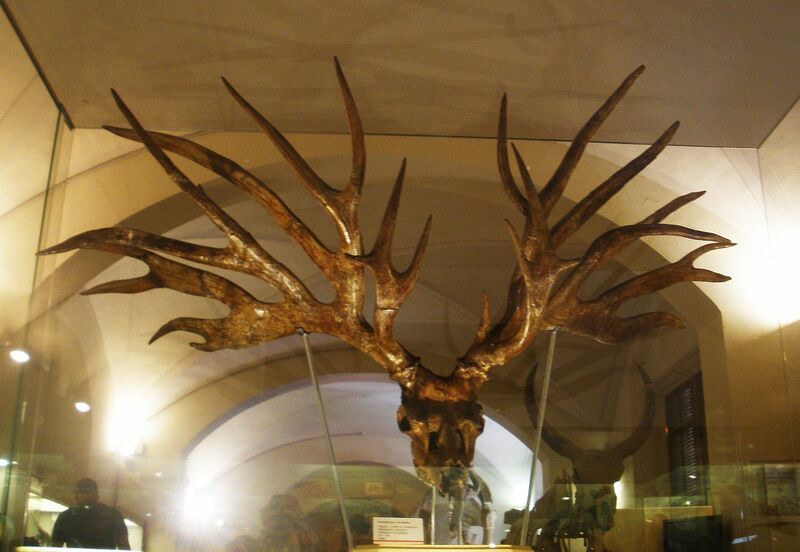 The Irish elk, commonly referred to as giant deer, is one of the largest deer species that ever lived. With well-preserved specimens being found in the peat bogs of Ireland, scientists estimated that these massive creatures stood about 7 feet tall at the shoulders on average, weighed well over 1,600 pounds, and carried the largest antlers of any known deer species. Just a full rack by itself could weigh up to 90 pounds. With all these characteristics, the Irish elk can be seen as a mega-sized version of the modern moose. 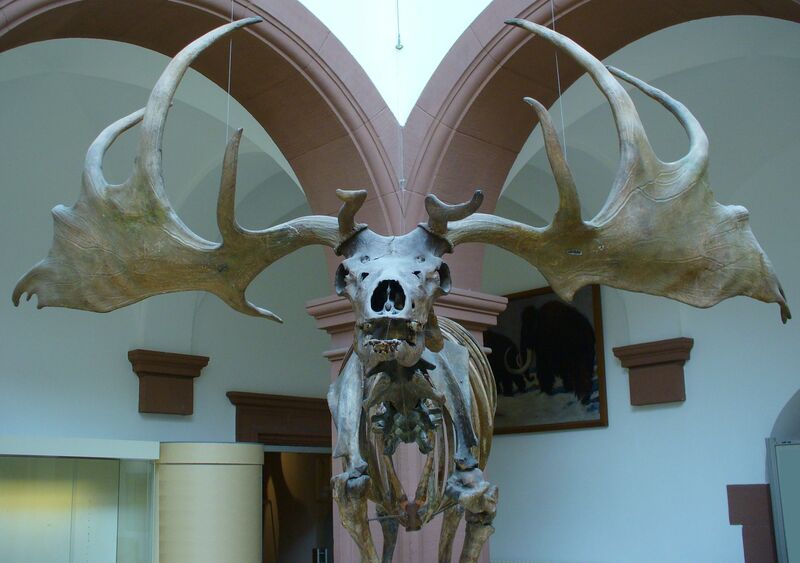 Irish elk first surfaced towards the end of the Pleistocene Epoch roughly 100,000 years ago. Specimens found in Siberia show that the species was still present as recent as 7,000 years ago, meaning it was likely a prime game animal for early human hunters. The species was found widely across Europe, Asia, and Africa and it is believed that hunting by humans may have have played a part in their decline. Believe it or not, scientists actually say their large and unwieldy antlers were most to blame for the elk’s eventual extinction. A decrease in high-quality forage was unable to sustain massive deer with equally massive antlers, and some speculate that the deer failed to grow smaller to adjust. Species of the Megaloceros genus are all honorable mentions on this list due to their size, and uniqueness of their antlers. Below is an artist’s depiction of them. Image from Apokryltaros on the Wikimedia Commons. From left to right are M. savini, M. cazioti, M. obscurus, M. pachyosteus, M. giganteus, and M. verticornis. Image from dantheman9758 on the Wikimedia Commons. Imagine a large modern moose with the head of a deer and you would have some picture of what the stag-moose looked like. This creature from the Pleistocene epoch lived alongside other megafauna such as giant beavers, woodland musk ox, and the dreaded dire wolf. Stag-moose can grow up to 1,500 pounds and reached 8 foot at the shoulder. Unfortunately, its large size did not help it any when the ice age ended, and competition between large-bodied animals lead to a mass extinction event in North America. Eventually, the stag-moose was replaced by the now iconic plains bison. Experts say that the animal’s downfall may be due to its inability to adapt to warming temperatures. The stag-moose was hyper-adapted to ice and snow, with razor sharp hooves designed to break ice and a thick coat to survive frigid temperatures. Due to its large size, the stag-moose was more than capable of fighting of predators such as ancient brown bears, wolves, and the American cave lion. It is believed that the stag-moose was also a popular target for early human hunters. Image from Ghedoghedo on the Wikimedia Commons. These large deer may not be the heaviest on this list, but they certainly have some of the most interesting antlers. The Eucladoceros genus was nicknamed the “bush-antlered deer” because of the unique shape of their racks. Their comb-like antlers can split into twelve tines per pedicle and were up to six feet wide. It is believed that due to the shape of the antlers, they were used mostly for presentation than any actual fighting. Species within the genus could be found across Europe and Asia and date back to the Early Pleistocene. This is it, the be-all, end-all of large deer. The broad-fronted moose is the largest deer to have ever existed—probably—and was so large, it weighed twice that of the Irish elk. If you’ve been keeping track, that puts this massive animal at well over 3,000 pounds! It was also surprisingly fast for its size since its long limbs allow for a gait known as “silt-locomotion,” which allows it to run quickly through snow or bogs. The animal lived in the colder parts of Europe and Asia during the end of the Pleistocene epoch and eventually crossed over into North America where it evolved into the stag-moose. Experts are still uncertain whether ones that stayed in Europe eventually developed into modern moose, or died out entirely after the end of the ice age. Image from Stanton F. Fink on the Wikimedia Commons. One of the earliest deer on this list, the Libracles genus lived during the Pliocene period starting 2.5 million years ago. These deer was not especially large, but had the largest antlers proportional to their body size, rivaling that of the great Irish elk. Despite being only slightly large that modern deer, the species of the Libracles genus sport antlers over two meters wide. Not surprisingly, some scientists suspect that this genus is the early ancestor of the Meglaoceros.